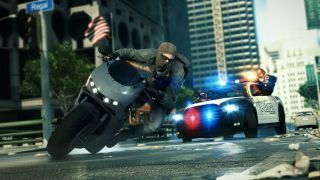 Battlefield Hardline claims it's "the fastest Battlefield ever"
Electronic Arts says Battlefield Hardline is "the fastest Battlefield ever," and that may well be true. Even so, I don't think I'd necessarily recommend shooting at pursuing police cars from the back of a crotch rocket, especially when the occupants of said cars are packing submachine-guns and an apparent green light to use them at will. I haven't been paying particularly close attention to Battlefield Hardline, so maybe this is old news to most of you, but what I find especially interesting about this trailer is the idea that the police can actually arrest criminals, rather than simply shooting them repeatedly. Mainly because of the obvious questions that follow: What happens to apprehended suspects—and, for that matter, the officers who arrest them? Are they out of the game while they're taken down to booking? Do arresting officers have to go AFK while they fill out their R-155s and get them filed before end-of-day? And what's the non-lethal option for the criminals? I'm assuming there has to be one, because if not, wouldn't everyone want to play as a bad guy? And then there's the part of me that thinks I'm reading too much into this. Perhaps Battlefield Hardline is less "Law and Order" and more B.A.D. Cats. Here, look it up. Battlefield Hardline comes out on March 20.